Don’t want to spend half the day in the car to get to a wide variety of outdoor activities? Emigrant Lake Recreation Area is a perfect fit for a spontaneous trip, or for planning gatherings of up to 300 people for day use. Located less than 10 minutes from the south Ashland exit, Emigrant Lake offers many family and sport recreation opportunities, including a water slide park! Emigrant Lake was created in 1926 for flood control and irrigation needs, and expanded by the Corps of Engineers for water for the growing town of Ashland in 1960, when it submerged the town formerly known as Klamath Junction. Sometimes swimmers report glimpses of the remnants of the town. Half a mile past milepost 5, Pioneer Cemetery is a favorite quiet place to reflect on the stories and struggles of the early settlers. Jackson County now operates the park. There are many venues to enjoy out at Emigrant Lake, with year-round RV full hookup sites at The Point. Shady, well spaced tent sites are at Oak Slope Campground, and for really large gatherings, organizers of family reunions, celebrations or retreat groups can reserve the group campground or the group picnic area, ideal for large gatherings; reservations are required, so contact the Jackson County Parks office at (541) 774-8183. Reservations are accepted with at least 15 days in advance, and no more than nine months in advance to the arrival date. The best part of Emigrant Lake is that it is so close to town, that for even a week-day outing it takes just minutes to enjoy some outside time at one of the many day-use picnic areas. The only downside to this convenience is it can be crowded during peak times. During the hot summer months, look across over a square mile of cool water, splash down 280 feet of waterslide, or walk along 12 miles of easy hiking along the shoreline! The picnic areas just past the water slide are nicest in the hottest summer months, because they get shaded early in the afternoon. With the horseshoe curve of the lake, new views open up each mile. Because the water level falls with the summer use, early summer provides the most appealing views of the lake. The elevation is 2,241 feet, so winter closures due to snow are rare. The tent camping sites do close from October to April, while the RV campground is open all year. Fishing and boating go together well, so find out the best times for the fish you want, and get your license at www.dfw.state.or.us/rr. The reservoir is stocked with Rainbow trout through the spring, and has largemouth bass, smallmouth bass, and black crappie. The boat ramp is open all year round during daylight hours. 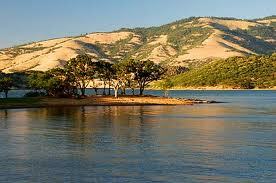 This reservoir allows high-speed watercraft so it is a great place for waterski and personal watercraft enthusiasts. The terrain around Emigrant Lake is typical of our Rogue Valley floor – rolling grassy hills and oak trees. Every day you will see hawks riding the thermals to get a view of the open ground and the good hunting it provides. The best wildflowers bloom abundantly in April, then as the grass dries to a rich gold in May, look for the indigo clusters of our native Triteleia laxa (previously Brodiaea) known also as Ithuriel’s Spear. Directions: Drive east from the I-5 exit 14 on Ashland St/ OR 66 towards Tolman Creek Road. After 3.6 miles turn Left onto Emigrant Lake Road. The lake looks smaller than it really is because it is in a horseshoe shape, so not all of it is visible at once. Keep going around the lake to discover more! Local tip – as a Jackson County park, no dogs are allowed in day use areas.